Nestled inside the gated community of Peninsula de las Estrellas, La Guarida del Cordero was finished in 2002 and glows with majestic brilliance. Enjoying panoramic waterfront exposures, the interior is equally luxuriant and has a layout of expansive and open living areas. Eight oceanfront master suites, a fully equipped gym, a massage room, a wine cellar, and a plush home theater with deep cushion seating treat residents and their guests to true splendor. The luxury extends to the guest house, designed by renowned Mexican architect Manolo Mestre and featuring two bedrooms, two living rooms, and a kitchen. Other amenities include a hot tub, an office, a deck, and an electric generator. The grounds offer a veritable la dolce vita with a swimming pool, tennis and racquetball courts, two artificial beaches, and a stairway that leads to the ocean. 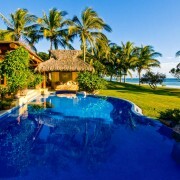 Tamarindo, perhaps the most beautiful golf course in the world, is just 40 minutes away. As a reflection of its breathtaking environment, La Guarida del Cordero was created as a splendorous residence providing every sumptuous amenity. PLEASE NOTE: FOOD AND ALCOHOL BEVERAGES ARE NOT INCLUDED - Pleas ask about extra costs for nannies, boats, private jetss, helicopter service. The paradisiacal hamlet of Costa Careyes was discovered by Gian Franco Brignone, an artist from Torino, Italy, who had a dream of establishing an environmentally conscious resort boasting a marriage of savoir vivre and sensuality with the artisanship of Mexico. While flying over the Pacific Coast of Mexico, Brignone was enchanted with the Coast of Careyes, a place of hedonistic wonder located between Puerto Vallarta and Manzanillo. Careyes was the perfect backdrop to create La Guarida del Cordero, a resort home poised as a stunning oasis of regal luxury. 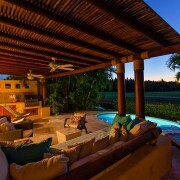 Wanting to live in “something truly Mexican,” the current owner has long been fascinated with the art and architecture of Mexico’s Spanish Colonials, spanning the late 1500s to 1800, and this magical retreat superbly fit his lifestyle vision. The community is a visage of international flavor where many languages are spoken and the luscious natural habitat is the universal appeal. Careyes offers its residents ambient nuances of light sea breezes, verdant hills, and seasonal evening storms that are visual marvels. Wind surfing, fishing, diving, and polo are also just outside the door. 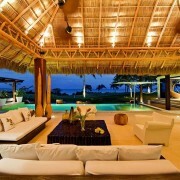 International festivals and parties grace Careyes, inviting warmth and joyous gatherings amid a picturesque paradise. Careyes was the perfect backdrop to create La Guarida del Cordero, a resort home poised as a stunning oasis of regal luxury. The current owner shares Brignone’s love of the area. A visage of international flavor where many languages are spoken and the luscious natural habitat is the universal appeal. Careyes offers its residents ambient nuances of light sea breezes, verdant hills, and seasonal evening storms that are visual marvels. Wind surfing, fishing, diving, and polo are also just outside the door. Costa Careyes, located between Puerto Vallarta and Manzanillo on Mexico's Pacific coast, was founded in 1968 by Gian Franco Brignone, an innovative artist, architect and entrepreneur from Torino, Italy whose dream was to create an ideal resort, following the philosophy of the Costa Esmeralda Sardegna Resort developed by The Aga Khan. He envisioned an environmentally conscious place that would combine European "savoir vivre" and sensuality with the beauty, climate, artisanship, and "alegria" of Mexico. While flying over the Pacific Coast of Mexico, Brignone was enchanted with the Coast of Careyes, which today has become best known for its preserved natural landscape, innovative architecture and pleasant year-round climate. Careyes is a place where the Italian ideals of "savoir vivre" and sensuality are complemented by the authentic beauty, climate, happiness and craftsmanship of Mexico. Several decades later, the successful result is a unique international community, appealing to the experienced travel residents who cherish its privacy, natural beauty, and quality of life. Now, 35 years after Brignone first made his home in Careyes, a fascinating community has emerged - one that is comprised of international travelers from Europe, Mexico, and United States and beyond. 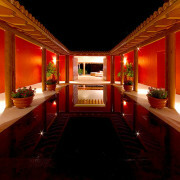 In Careyes, every nationality is welcomed and appreciated. In fact, a recent poll of the residents of Careyes showed that nearly all real estate owners speak at least two languages, with Spanish, French, Italian and English being among the most common. The poll also found that residents have chosen to build homes in Careyes because of the privacy and quality of life the community provides, as well as the universal dedication to preserving the natural habitat. Each year, Careyes hosts several festivals, parties and gatherings that recognize some of the world's greatest traditions, including the annual Chinese New Year celebration. Throughout the year, residents and visitors alike also enjoy a host of other activities including Polo tournaments, art exhibits and the sea turtle preservation program. 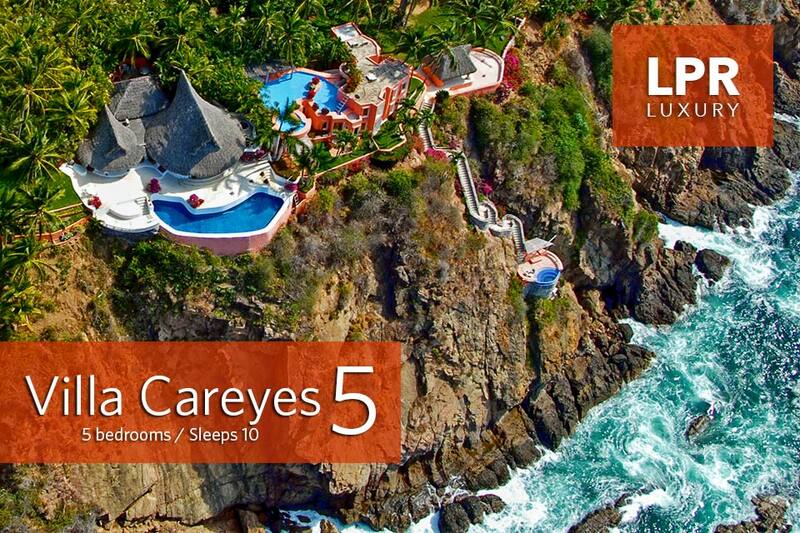 In the words of Gian Franco Brignone, "Careyes is a guarded secret only known by special people. One of the most beautiful golf courses in the world, Tamarindo, is just 40 minutes away, and tennis courts are available at the Hotel Careyes, which is just five minutes from the house. Costa Careyes is part of Costa Alegre and the State of Jalisco, probably one of the most beautiful areas of Mexico. The state of Jalisco is the third richest state of Mexico, and Costa Alegre is 100 miles of virtually undeveloped coast guarded by stringent development rules. A guarantee for the future! "Careyes" means tortoise shell and has always been considered a big nesting area. Every summer a beach camp is built in order to save sea turtles. To date, residents and guests have collected 200,000 eggs and released 75,000 baby turtles belonging to three species. This area offers perhaps the most dependably excellent Winter beach weather in Mexico. Daytime highs are in the low to mid-eighties while nighttime lows average in the mid-sixties to seventy degrees. Summer brings oppressive heat and humidity. The best months are December - March. Winter storms seldom affect the coast this far south. Summers are the primary rainy season for the region. Careyes is blessed with a micro-climate unique to the Pacific coast of Mexico. From December to May, it experiences sunny, moderate days with low humidity and a constant light sea breeze. Evenings might be cool enough to justify lighting a fire but purely for ambiance, for heating is never needed. To feel it is to believe it. The other half of the year is greener, more lush, hotter, and more humid but fascinating for the change in wild life. The evening storms and skies can be spectacular, and they attract many visitors. The ocean is warm year round.